Rare Launceston Mint Coin | Launceston Then! King Aethelstan established a mint at St Stephens, Launceston, circa. 935, beside his new monk’s cell; it produced coin of the realm into the reign of King Henry II (1154 – 1189). The first recorded Cornish coin is a silver penny of Ethelred II, on the obverse of which is the king’s bust wearing a diadem, and + /EDELRED REX ^NGLOX. On the reverse side is an open hand extended downward, sygnifying the Hand of Providence, and +BRVN M-O L^NSTF. Another coin is from the reign of Harold I. which has the king’s bust with sceptre and +H^ROLD R:EEDX. On the reverse +G^PINE ON L^HE. William I coins bear +S^SGTI STEPHANII. Under King Aethelston, in 928, it was agreed only one kind of money should be legal tender in the realm. The importance of Launceston over 1,000 years ago is to be emphasised by an ‘exceedingly rare’ coin which is to be auctioned in London on Friday. The coin was minted in the Saxon mint at St Stephens, and is a penny from the reign of Aethelred II, who reigned between 978 and 1016. This is the only known coin from this mint outside the British Museum – the museum has a similar penny which it acquired over one hundred years ago, in 1896. The London auction house, Spink, which is part of the Christie’s Group, is to sell the coin as part of the John Mayne Collection, which also includes a number of extremely rare coins from the mint. Lawrence House Museum, in Launceston, and the Royal Cornwall Museum, in Truro, were both alerted to the sale of these rare coins by their owner, John Mayne, who wrote to tell them he was having to sell the collection which had been in his family over 50 years because of his financial circumstances. Coins from this period were crudely stamped, or hammered, using a die. This means that each coin is slightly different , and the embossed surface is sometimes off centre, or even has a double image where the die has bounced. The Aethelred coin is estimated at £3,000 to £4,000, and is described by the auctioneers as ‘good, very fine, and exceedingly rare’. It is stamped ‘BRYN MO LAANZT’ meaning it was by the Saxon ‘moneyer’ Brun, and minted at Lanstephan – the church of enclosure of St Stephen. The coin is thought to be from an ‘undeclared’ hoard, discovered in the East Midlands in 1992. But because the discovery was kept secret little is known. The Royal Cornwall Museum also hope to bid for a coin minted at Launceston for William the Conqueror. The William Penny is one in the sale – also described at ‘extremely rare’ – and estimated at £1,000 to £1200. At Lawrence House Museum in Launceston, curator Jean Brown says that the sale is ‘very exciting’ but that they will not be bidding for the most expensive Aethelred coin. The Friends of Lawrence House have been negotiating with ‘the right people, she says, in the hope that one of the coins can be bought. This is listed as ‘extremely fine, extremely rare’, and with an estimate of £1,500 to £2,000. “We feel that we should have a go at getting something back into Cornwall,” she says, ‘and we don’t think that there are any other William the First coins in Cornwall.” The museum also hopes to be able to buy one of the two local ‘tokens’ which are included in the sale. These were minted for local traders in the 17th century, and Jeremy Cheek, from Spink, says that they were issued because of the great shortage of change at that time. “They are fascinating historically”, he says. “They were also a form of advertising, and we can often trace where they traded from.” The two local ones in the sale are farthings, the first minted for Degory Bewes, of St Stephens with the ‘Mercers Arms’. This has an estimate of £80 – £120. The second was produced for Oswald Kingdom, and contains the tallow chandlers arms. Estimated at £100 – £150, this is also listed as ‘rare’. Jean Brown says that they don’t want to raid other projects to find the money, but she hopes a way can be found to bring one of these coins back to the town, “This sort of thing doesn’t come up very often!” she says. GENEROSITY BRINGS RARE COINS HOME TO LAUNCESTON MUSEUM. Possibly the most expensive penny in Launceston has just changed hands in a top London auction house, and will soon be winging its way to a new ‘high security’ display in the town. But there was disappointment when a bid for one of the two oldest known coins from the Saxon mint at St Stephens was topped by an unknown buyer – this was the penny minted before the building of Launceston castle, in the reign of King Aethelred. The only other known example is in the British Museum in London. Royal Cornwall Museum had hoped that they would be able to afford the coin, but it went for one hundred pounds more than their £3,800 bid at Spinks, auctioneers, last Friday. But Launceston scored a hit with all three of the local coins that they had hoped to acquire. The oldest was minted in the time of Domesday in the name of William the Conqueror. more than compensated by the prices paid for two more local coins. These were both ‘tokens’ issued at the end of the 17th century, says local historian Jim Edwards. They were produced by various towns due to a shortage of [small] change, caused by a lack of national mintings. Cornwall was unique, says Mr Edwards, because it was the only county where individual traders minted their own ‘coinage’, but these tokens became extremely rare when most were melted down when the practice was banned by law at the beginning of January 1818. The two purchased by Lawrence House are both farthings, the first, issued by Degory Bewes, of St Stephens, shows the Mercer’s arms – Mr Edwards says that a mercer was a general shop-keeper. * This coin was estimated at £80 to £120, but the hammer fell at £300. The second token was issued by Oswold Kingdon,+ a tallow chandler of Launceston. This was estimated at £100 to £150, but again the tension of the auction pushed this to £420. Jean Brown, curator of the town’s museum, says that this is a very good result from the sale. The artefacts came from a small collection of Cornish coins collected over around 50 years by John Mayne and his father. Ironically, Mr Mayne died a week before the sale, but he had written to Cornish museums expressing his hope that the collection would come home to Cornwall. At the Royal Cornwall Museum, in Truro, curator Roger Penhallurick says that although they failed to but the Aethelred coin, the museum did manage to buy another Launceston-minted William the First penny. But he says that it is a tragedy that the collection has been split up. DOMESDAY BOOK PROVES JIM RIGHT. It had been hoped that an even rarer coin would come back to Cornwall but – as reported in the ‘Post’ – Royal Cornwall Museum failed in their bid for one of the two known Saxon coins from the St Stephens mint from the reign of King Aethelred. But Launceston man, Jim Edwards, who has dedicated his retirement to researching the history of the town, has taken up his pen because he says that the County museum have misunderstood the use of silver pennies from the St Stephens mint – especially the older Saxon penny which Cornwall failed to win at auction. Danegeld was a form of tax to an invader, and a museum spokesperson has said that this was the purpose of the coins produced by the mint at St Stephens. 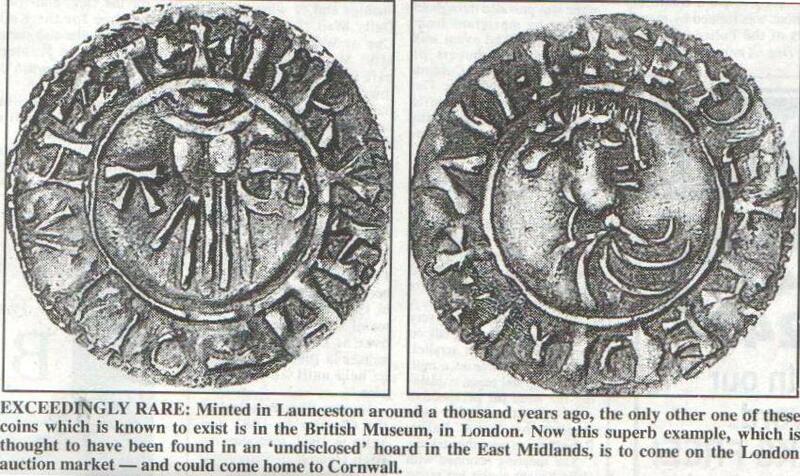 He says no Launceston coin has ever been found in Cornwall, and the few that have been found are widely scattered. “All Saxon coins are rare in Cornwall, suggesting that most of the county’s inhabitants relied on barter,” he writes.